When I was about 6 years old, I have tried to draw simple map of Indonesia. Yeah, this is Indonesia, and we learnt to love our country since childhood :-). Back to drawing, my favourite island is Sulawesi. Its shape is the easiest to remember: like the letter k with horisontal head. I used to love to draw that island. And also its little sibling: Halmahera island, another k, but headless. And I found Kalimantan as the most difficult island to draw. Sulawesi. Sulawesi’s Toraja coffee is internationally famous for its special, unique, earthy taste. I also love the taste of coffee from Manado a nice friend gave me last year. But there are two small towns in Sulawesi, Sapan and Minanga, of which names do not ring a bell for even most of Indonesians. Starbucks sent their guys there. Starbucks had previously their own standards of Sulawesi Coffee. But they wanted to find the classic taste of Sulawesi Coffee. At last they found it in small markets around those two small towns. 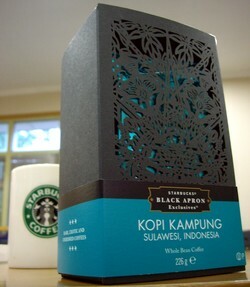 Starbucks repackaged the coffee, and named it Kopi Kampung (Coffee from Village). Packaged in exclusive pack, Kopi Kampung is sold US$13 per pack in the US, and US$15 in its origin country: Indonesia. The taste? They call it a bit spicy. I prefer to call it unregrettable. Indeed, you will regret if you don’t taste it. aku bbrp wkt yll dpt kopi dr ibeth…teks yg ada dibungkusnya :Koffiebonen- Douwe Egberts anno 1793-Excellent arome -Intens van smaak met een rijk aroma…digiling manual tanpa diayak..jd msh tersisa butiran2 besar…nyem..nyem luwezaaaat……aromanya smriwing, jd inget kopi bikinan penduduk di tepian danau ranau – muara dua – baturaja…..